February 1993: Ramzi Yusuf, the mastermind of the bombing of the World Trade Center in New York, which claimed 7 lives and injured more than a thousand people,, declared the towers not a civilian target but a military one, by virtue of the fact that it might house a "Zionist official." June 1993: "Boom! Broken windows. Jews in the street," is how one of the plotters described the carnage that would ensue from a planned "day of terror" with simultaneous bombings of the United Nations complex, the Lincoln and Holland tunnels, and other New York landmarks. July 1997: Ghazi Ibrahim Abu Maizar's near-explosion of a pipe bomb in the New York City subway system. July 2002: Hesham Mohamed Ali Hadayet's attack on the El Al counter at Los Angeles International Airport, killing two. September 2005: Jam'iyyat Ul-Islam Is-Saheeh plot against two Los Angeles-area synagogues, disrupted due to a dropped mobile phone. July 2006 : Naveed Haq assaulted the Jewish Federation of Greater Seattle, murdering one and injuring five. May 2009: Four arrested in attempt to blow up two New York City synagogues. (1) Inexplicably, Muslim-on-Jewish violence peaked in the years 1990-97 and has declined since. (2) Muslims of immigrant and of African-American origins have each engaged in a share of the attacks roughly proportionate to their demographics. 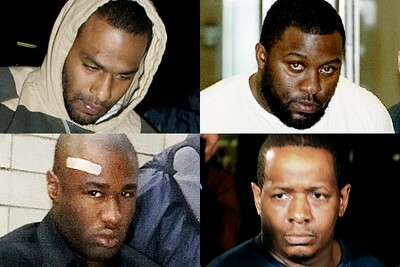 The four accused New York City bombers: David Williams (top left), Onta Williams (top right), Laguerre Payen (bottom left), and James Cromitie (bottom right).